How do supercritical fluids work? When a gas such a carbon dioxide is compressed and heated, its physical properties change and it is referred to as a supercritical fluid. Under these conditions, it has the solvating power of a liquid and the diffusivity of a gas. In short, it has the properties of both a gas and a liquid. This enables supercritical fluids to work extremely well as a processing media for a wide variety of chemical, biological, and polymer extraction. Near liquid densities increase the probability of interactions between the carbon dioxide and the substrate, similar to a liquid solvent. The gas-like diffusivities of supercritical fluids are typically one to two orders of magnitude greater than liquids, allowing for exceptional mass transfer properties. Moreover, near zero surface tension as well as low viscosities similar to gases, allow supercritical fluids to easily penetrate a microporous matrix material to extract desired compounds. The synergistic combination of density, viscosity, surface tension, diffusivity, and pressure and temperature dependence, allow supercritical fluids to have exceptional extraction capabilities. Why is carbon dioxide used most often in SFE? Supercritical fluid extraction has emerged as an attractive separation technique for the food and pharmaceutical industries due to a growing demand for “natural” processes that do not introduce any residual organic chemicals. Supercritical carbon dioxideis by far the most commonly used supercritical fluid. The unique solvent properties of supercritical carbon dioxide have made it a desirable compound for separating antioxidants, pigments, flavors, fragrances, fatty acids, and essential oils from plant and animal materials. In the supercritical state, carbon dioxidebehaves as a lipophillic solvent and therefore, is able to extract most nonpolar solutes. Separation of the carbon dioxidefrom the extract is simple and nearly instantaneous. No solvent residue is left in the extract as would be typical with organic solvent extraction. Unlike liquid solvents, the solvating power of supercritical carbon dioxidecan be easily adjusted by slight changes in the temperature and pressure, making it possible to extract particular compounds of interest. With the addition of small amounts of polar co-solvents, even polar materials can be extracted. Additional advantages of carbon dioxide are that it is inexpensive, it is available in high purity, it is FDA approved, and it is generally regarded as a safe compound (GRAS). Supercritical carbon dioxideis also desirable for extraction of compounds that are sensitive to extreme conditions because it has a relatively low critical temperature (31°C). Why is carbon dioxide most often the media of choice for SFR? The properties which make supercritical carbon dioxide an attractive solvent for extraction also apply to its use as a medium for reaction chemistry. A fluid’s most important physical and transport properties that influence the kinetics of a chemical reaction are intermediate between those of a liquid and a gas in the supercritical carbon dioxide. The reactants and the supercritical carbon dioxide frequently form a single supercritical fluid phase. Supercritical fluids share many of the advantages of gas phase reactions including: miscibility with other gases, low viscosities, and high diffusivities, thereby providing enhanced heat transfers and the potential for fast reactions. 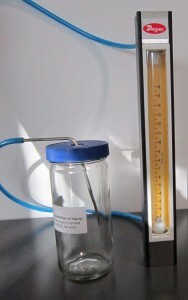 Supercritical fluids are especially attractive as a reaction medium for diffusion-controlled reactions involving gaseous reagents such as hydrogen or oxygen. An example of using supercritical fluids as a reaction medium is the hydrogenation of pharmaceuticals to promote enantio selective hydrogenation to favor a cis or trans version of a molecule during hydrogenation. By performing the reaction in two, instead of three phases, the rate of hydrogenation reactions can be increased over 1,000 times. As a results, the size of the reactor and the associated equipment is less than 1/10th that of conventional autoclave systems. Oils and fatty acid esters, as well as hydrogenare soluble in supercritical carbon dioxide. The reaction rate is increased because excess hydrogenis always available for reaction, and the catalyst pores are not filled with stagnant liquid. How does SFT’s carbon dioxide pump work? Various types of pumps can be used for supercritical fluid applications. For medium to large volume processes, a pneumatic booster pump is most often used. A diaphragm pushes against a piston to compress the liquid carbon dioxide to a set pressure point. The air that drives the pump increases the liquid carbon dioxide pressure (boosts) in a ratio of about 100 to 1. So, for every 1 psi of air delivered to the pump, the carbon dioxide pressure is boosted by 100 psi (i.e. air at 50 psi will deliver about 5,000 psi of carbon dioxide). The CO2 pressure is controlled by an air regulator which in turn controls the pump operation. Once the desired pressure is selected, the pump pressurizes the overall system to this set point. When the restrictor valve is opened, the pump will continue to actuate to maintain the desired set point. Does the liquid carbon dioxide pump shut off during a static extraction? Yes, the pump will fill/pressurize the extraction vessel up to the set point. If there is no flow of material out of the vessel, the pump will shut off. As soon as the variable restrictor is opened, dissolved materials (analyte) and carbon dioxide begin to flow out of the pressure vessel. The pump will begin to actuate to maintain a pressure set point. Think of the restrictor as a Back Pressure Regulator. As you adjust the restrictor to various flows, the pump will speed up or slow down accordingly to maintain the overall system set point pressure. Why do the SFT-150 and SFT-250 require a chiller / recirculator? The chiller is used to transfer heat away from the pump head. Cooling the pump head ensures that only liquid carbon dioxide reaches the pump. This is important because the unit cannot pump gaseous carbon dioxide. The chiller essentially does two things. It counteracts the heat of compression which occurs inside the pump head, and it removes heat caused by friction of the piston moving back and forth. Both of these heat sources need to be controlled. If the pump head is not cooled, liquid carbon dioxide will enter and immediately flash to gas. The pump will cavitate and will operate inefficiently or not at all. Why not use a helium head space C02 tank instead of a chiller? The chiller eliminates the need for helium headspace carbon dioxide tanks. The action of pumping heats up the liquid carbon dioxide causing the liquid carbon dioxide to flash in the pumping head to gas. This results in cavitations and low pump efficiency. Cavitation can be eliminated two ways: first, by use of a chiller assembly to cool the pump head and/or carbon dioxide fluid to about –5 degrees Celsius, eliminating the cavitation problem. Or, second, by use of a higher delivery pressure of carbon dioxide (as delivered in a helium headspace tank at 1,500 psi). Higher delivery pressure keeps the carbon dioxide from flashing to gas, causing the cavitation problem. However, helium headspace tanks cost about $145.00/tank. A standard carbon dioxide is on the order of $30/tank. The chiller assembly pays for itself quickly after about 4-6 months of standard operation. Supercritical Fluid Technologies, Inc. holds a Patent on its “Chill Can” assembly. Why and how are co-solvents sometimes used in SFE processes? A small amount of a co-solvent increases the ability of supercritical carbon dioxide to dissolve polar compounds. Neat supercritical CO2 has dissolving properties similar to hexane. This means that, by itself, carbon dioxide is very good for dissolving relatively non-polar materials. The addition of just a small quantity of co-solvent enhances the solubilizing power of the supercritical carbon dioxide, making it possible to extract much more polar molecules. Typical co-solvents include: methanol, ethanol, and water. Co-solvent addition is typically done using an HPLC type pump. There are two traditional methods a co-solvent pump can be used. Firstly, as a co-solvent doping module where co-solvent is added to the sample to a desired % of the vessel’s overall volume and then the CO2 pump is actuated to bring the vessel up to the desired set pressure for extraction. Secondly, the CO2 and co-solvent pump are both actuated at the same time with the restrictor valve open to maintain a set ratio of co-solvent to CO2 in the sample vessel. Is there a correlation to use with the flow rate of CO2 to maintain a fixed percentage of ethanol in the vessel? Base the amount of co-solvent in the system as a function of the vessel volume. If your vessel is a 100 ml and you want 5% ethanol in your extraction, you would want to add 5 ml of co-solvent to the vessel before you begin the extraction. Once the dynamic flow/extraction has begun, you want to replace the amount of co-solvent that is flushed out of the vessel with the carbon dioxide, maintaining a 5% level throughout the vessel. A Mass Flow Meter (a simple flow meter will suffice) can be used to gauge the amount of carbon dioxide flowing out of the vessel under your dynamic extraction flow step. Take 5% of this volume of carbon dioxide flow adding back that amount of ethanol to the vessel with the co-solvent pump. This is the least complex method of keeping a constant amount of co-solvent in the vessel throughout your extraction. When and why is a “pre-heater” for the fluid recommended? A liquid CO2 pre-heater is recommended for all extraction work. Regardless of vessel size and despite the use of band heaters, heating efficiency is limited because of the relatively small vessel surface area relative to the total vessel volume. Especially at high flow rates, SFE’s with larger vessels but no preheater will not hold temperatures with a high degree of accuracy during dynamic flow. To compensate for the physical limitations of the vessel heaters, a fluid pre-heater is used to regulate the temperature of the carbon dioxide and co-solvent before they reach the main sample vessel. For the most efficient and reproducible extraction work, it is highly recommended that a pre-heater always be used. Which extraction / reaction vessel is right for me? Supercritical Fluid Technologies, Inc. offers a wide variety of sample vessels and options to meet our clients’ needs. 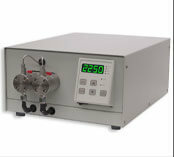 Vessels ranging from 5 ml up to 5000 ml are available for our standard bench scale units. 20 liter and larger vessels may be used in our pilot scale processing systems. Many options are available for these vessels from windows to mixing, as required by the application. One issue to keep in mind as you decide on a vessel for your application is that these are ASME designed vessels and they are heavy! For example, a 4000 ml vessel in our bench scale system weighs in at 280 lbs. You will need an engine hoist to move this vessel around the laboratory! Fortunately, vessels in both the SFT-150 and SFT-250 are mounted on sliding racks. The weight of the vessel becomes an issue only when interchanging vessels. The 5 ml, 25 ml, 50 ml, 100 ml, 300 ml, 500 ml, and 1000 ml vessels, which are ideal for preliminary work, can be handled with little difficulty. What is the purpose of the SFT-250 “over temperature” logic controller? The “over temperature” logic controller keeps the vessel’s outer wall temperature from getting extremely hot and, in turn, going beyond the internal set temperature of the sample vessel. For example, if you have an internal vessel temperature set to 40oC, you would set the external wall temperature or “over temperature” controller to 45oC. In this way, you maintain the internal temperature at 40oC without exceeding the desired temperature. Keep in mind you are heating a very large metal mass in the sample vessel. There is a certain amount of histolysis of heat through the vessel wall. To maintain accurate temperature control, management of both the internal vessel temperature and external wall temperature is the best solution. How do I change a hand-tight series vessel seal? Remove the existing o-ring carefully. Be sure that you do not scratch the vessel’s o-ring groove surface with any tools. We recommend using a plastic or wood stick to remove existing o-ring. Clean all surfaces thoroughly with solvent. Clean the inside of the vessel seal. The inside surface is where the o-ring actually seals. Carefully install the new o-ring in the groove of the cover. New o-rings tend to be stiff and may need to be slowly worked into position. It is sometimes helpful to heat the o-ring in a pot of hot water before installation. This will help relax the o-ring material long enough for installation. Lubricate the o-ring and seal area of the vessel with o-ring grease. A small amount of grease works best. Also lubricate the threads of the nut with process compatible thread lubricant. Thread the cover into the body of the vessel until you feel the resistance of the o-ring being forced into the seal area. Do not try to force the o-ring all at once. Work the threads back and forth gently until the o-ring has worked into the seal area. Continue to tighten until the threads bottom out. How long does it take to fill a 500 ml vessel with the SFT-10 SCF pump? The SFT-10 SCF pump operates in a mode that once the CO2 tank regulator is opened, CO2 liquid will flow through the pump and equilibrate into the sample vessel to tank pressure (typically 750 psi given the vapor pressure of CO2 is ~750 psi at room temperature). CO2 is in reality a liquid-gas and compressible at lower pressures. What you will observe once you have started pumping CO2 into your sample vessel is that from tank pressure up to about 1250 psi, the pressure increase is very slow because you are pumping liquid CO2 that is rather compressible. Once you have crossed over the 1250 psi range, the density of the liquid CO2 has now approached 1 gram/ml and the liquid CO2 begins to pump very similar to any traditional HPLC type pumping unit. Further complicating this answer is the fact that it is always assumed that the sample vessel has been filled with raw materials of varying densities and the dead volume within the sample vessel varies from experiment to experiment based on how well the raw materials were packed into the sample vessel. All of the above variables influence the actual “fill time” of your sample vessel in a traditional SFE experiment. Some sample vessels are designated as single ended (SE) and others double ended (DE). What does it mean? The “single ended” (SE) vessels only open on one end (one cap). The “double ended” (DE) sample vessels have vessel covers on both ends and can be opened on both ends. The smaller vessels are double ended to make it easier to clean inside the vessel. The larger vessels have a sufficient diameter, so opening only one end is acceptable. 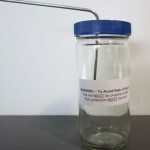 From a costing standpoint, once you get above 100 ml in sample vessel size, the cost savings for a single ended vessel is significant versus a double ended vessel. What is a variable restrictor? A variable restrictor, also known as a Back Pressure Regulator (BPR) is a key component in the successful application of supercritical fluid technology. You will note that all of our products have this key component. The restrictor valve allows for the controlled and metered release of the pressure built up in the sample vessel into the collection assembly. Materials that have been solubilized in the SCF CO2 can now be collected at atmospheric pressure. Beyond the metering out of the flow, the restrictor valve assembly also compensates for the Joule-Thompson cooling that occurs through expansion of pressurized CO2 by adding heat to the assembly. The heating ensures that the valve will not freeze and solubilized analytes precipitate plugging this valve. Can I process with supercritical water in my SFE unit? Applications for water as a process media range from subcritical water extraction to supercritical water oxidation to supercritical water reaction processes in this application niche. Supercritical Water Oxidation (SCWO) is among the most challenging applications of supercritical technology. Very high temperatures (over 400oC) and moderately high pressures are required to achieve the critical point of water. An additional difficulty is corrosion, which is a problem for all sub-critical and supercritical water systems. Special materials for vessel linings and tubing are needed to resist the highly reactive chemical species generated during the process. These challenges demand superior engineering and design expertise for all system components. The water and process streams must both be pumped to high initial pressures under exact flow and pressure control. The heat exchangers are subjected to high heat transfer rates at high temperatures, but must maintain precise temperature control. 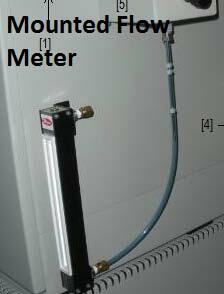 The reaction vessel requires exact temperature, pressure and flow control. The vessel must seal reliably and be leak free each time it is used, regardless of the harsh operating environment. Downstream processing such as cooling heat exchangers, collection vessels, gas/liquid separation and pressure control must be efficient. It would be much less expensive to purchase a dedicated supercritical water type unit than go through the detailed modifications needed to change the traditional SFE unit to use water as the supercritical fluid. What are the different pumps used in SFE and how do they work? Supercritical Fluid Technologies employs various types of pumping packages for their SFE units. Our analytical scale SFT-110 and SFT-110XW SFE units employ electrically driven pulseless pumps similar to traditional HPLC technology. However, the pump cools the liquid CO2 to 0 degrees Celsius using a thermo electric cooling mechanism (Peltier cooling) which allows efficient pumping of the liquid CO2 up to process pressures. Currently under development are larger versions of these liquid CO2 pumps that can pump liquid CO2 to 10,000 psi (689 bar) at 250ml/min, 500ml/min, and 1000ml/min respectively. Look for these pump packages in mid 2012. For the SFT-150, SFT-250, SFT-NPX-10 and larger pilot and commercial extraction units where large flow rates are needed, we currently employ a pneumatic air-driven pump. A special fluid heat exchanger is used to cool the liquid CO2 down to the 0 degrees Celsius range to allow for efficient pumping. The CO2 liquid is then delivered to the pump where the pumping package acts very much like a booster pump where the delivery pressure of the liquid CO2 is increased to the meet the application need. An air compressor is typically specified with these larger units such as an Ingersoll-Rand, Model 1240: Two Stage Air Compressor, HP Rating 5.0 HP, Air Delivery 15 Cubic Feet per Minute, Maximum Pressure 175 PSI, Phase Three, Voltage Rating 230/460 Volts, 50 Hz, Current Rating 15.3 Amperes, Tank Capacity 80 Gallons, Tank Type Vertical, Oil Capacity 32 Ounces, Receiver 80V, Height 67 Inches, Length 32 Inches, Width 24 Inches, NPT Outlet (F) 1/2 Inch. The key specification is 110 psi, 15 SLPM flow. What is a cyclonic separator? The term a “cyclonic separator” is used to designate a type of collection assembly that allows the material that has been extracted from the sample vessel to be collected through running the outlet tubing of the sample vessel/back pressure regulator at an angle along the walls of the collection vessel creating a cyclonic vortex that deposits materials on the walls of the collection vessel and the gaseous CO2 to evacuate to vent. Cyclonic separation minimizes the amounts of materials that get carried out with the gaseous CO2 through the venting process. This is very similar to the technology used in something as simple as the Dyson vacuum cleaner! Some SFE suppliers use an actual SS pressure vessel to act as the cyclonic separator/collector and others employ vials and jars in place of the SS collection vessel, but both essentially carryout the same cyclonic separation/collection process. In the case of vials or jars, the outlet tube from sample vessel/BPR deposits extracted materials along the walls of the vial/jar and allows the CO2 to evacuate the collection vessel thus minimizing the loss of materials with the CO2 gas. How do I reinstall the 5 micron filter disc in my sample vessel? The 5 micron discs typically have loose tolerances from our supplier (meaning they tend to fall out like you are experiencing, because they are slightly smaller than the slot for them to fit in within the sample vessel cover). What you need to do is take a “center punch” tool. This is similar to a punch used by woodworkers to punch nails into the wood past the surface. A center punch can also simply be a piece of stainless steel that is the shape of a pencil like a traditional nail. You want to slightly “deform” the edge of the 5-micron filter part by making the edge stick out further so when you press the disc back into the filter assembly it stays in position. Place the disc on the work bench and use the center punch or similar tool to punch the edge of the disc with a hammer on 4 sides (90 degrees apart), deforming the edge slightly making the edge wider and thus giving the filter assembly holder something to grab onto when you press the filter back into the assembly. Can my SFT-10 SCF pump argon and xenon? Xenon has a critical point of 15.9 degrees Celsius and 841 psi and it is indeed theoretically possible that the SFT-10 SCF pump can pump this fluid. However, the solvating properties are similar enough to warrant using SCF CO2 over xenon given that SCF CO2 is approximately $35 for a 60 lb tank with a dip tube vs. xenon which is approximately $300 for a 60lb tank (you would need to get the costing locally). SFT cannot warrant or guarantee that SFT pumps can pump xenon liquid as a SCF. Argon has a critical point -122.13C and 711 psi. Because of the low temperature, the SFT-10 SCF pumping package would not be capable of pumping this SCF. Can the SFE units of our company use butane and propane as the SCF? The SFT-110, SFT-110XW, SFT-150, SFT-250, and SFT-NPX-10 units are not designed and manufactured to Class I Division II explosion proof standards and therefore cannot safely be operated with these liquid gas solvents. How do I clean the check valves in my SFT-10 SCF Pump Package? Is it possible to use a Dewar type cylinder for the SFT-150, SFT-250, and NPX scale SFT systems? Unfortunately, Dewar tanks have too low of a delivery pressure and temperature for our pumping systems in these units. Typically what a client will do when processing a lot of material on the SFT-150/SFT-250 scale unit in a lengthy “dynamic flow” mode is manifold 4-6 tanks together for CO2 delivery. On the larger scale NPX units, there are 2 options for CO2 delivery. You can either go with a manifold in combination with a recycle system which allows long processing runs OR a bulk delivery tank, which is approximately 6000 lbs, with booster pump to deliver the liquid CO2 to the system. What viscosity of material can be pumped through the SFT-Series Co-Solvent Pumps? Our testing has successfully shown that traditional vegetable oil has been able to pump through our co-solvent pumps. As long as the solvent of choice is less viscous than vegetable oil and compatible with our systems (see manual for a complete list of incompatible solvents), it should be able to be pumped with the SFT-Co-Solvent pumps. How Do I Install the Gas Flow Meter into the SFT-110, SFT-110XW, SFT-150 or SFT-250 SFE Systems? 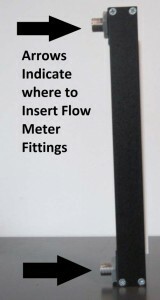 How do I install the gas flow meter into the SFT-110, 110XW, 150, or 250 SFE Unit? 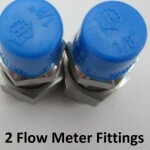 Optional flow meters can be purchased as an upgrade to the SFT-110, 110XW, 150, and 250 SFE Units. 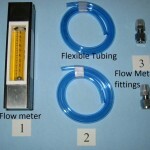 Locate the “L shaped tube” with sharp end (90° bend S/S tubing), the septa lid jar, 2 flow meter fittings, and 2 pieces of flexible tubing (as seen below). 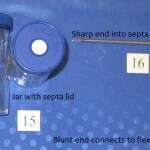 Insert sharp end of “L” shaped tube into jar (or vial) with septa lid. 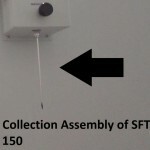 Slide the septa jar (with the “L” shaped metal tube) into the collection assembly of the SFE outlet (see below). Connect two (2) “Flow meter fittings into the back of the flow meter.